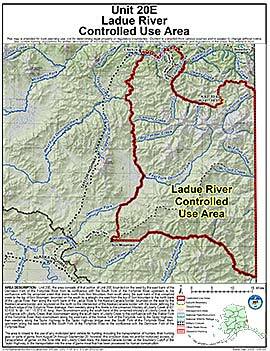 Area Description: Ladue River Controlled Use Area: the area consists of Unit 20E bounded on the west by the east bank of the Dennison Fork of the Fortymile River from its confluence with the South Fork of the Fortymile River upstream to the confluence with the unnamed creek that drains north from Son Mountain, then south along the east bank of this creek to the top of Son Mountain; on the south by a straight line east from the top of Son Mountain to the north bank of the Ladue River, then along the north bank of the Ladue River to the Alaska-Canada border; on the east by the Alaska-Canada border; and on the north from the intersection of the Alaska-Canada border and the divide on the north side of the mainstem of the Sixtymile drainage, then westerly along this divide to the unnamed tributary of Liberty Creek at N 63° 53.630’, W 141° 15.370’, then downstream along the south bank of the unnamed tributary to its confluence with the mainstem of Liberty Creek, then downstream along the south bank of Liberty Creek to the confluence with the Walker Fork of the Fortymile River then downstream along the west bank of the Walker Fork of the Fortymile River, to the Taylor Highway then westerly along the Taylor Highway to the Taylor Highway bridge over the South Fork of the Fortymile River, then upstream along the east bank of the South Fork of the Fortymile River to the confluence with the Dennison Fork of the Fortymile River. Restrictions: The area is closed to the use of any motorized land vehicle for hunting, including the transportation of hunters, their hunting gear, and/or parts of game, Aug 24-Sept 20. However, this does not prohibit motorized access or transportation of game on the Nine Mile and Liberty Creek trails, Alaska-Canada border, or the Boundary Cutoff of the Taylor Highway or the transportation into the area of game meat that has been processed for human consumption.